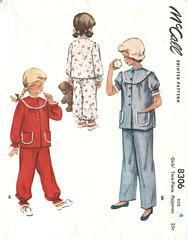 Vintage McCall 8306 sewing pattern from 1950. Top has front yoke and patch pockets. Short sleeves gathered to bands or long sleeves gathered to elastic. Trousers have elastic waistband and optional elastic at legs. Size 4; Breast 23; Waist 21. Pattern is cut and complete. Envelope is in very good condition; complete flap.